This is an ancient group of fern allies, which has declined dramatically since their peak in the Carboniferous era. The rock tassel fern (Huperzia squarrosa), which grows in the Wet Tropics today, is very similar to 415 million-year-old fossils from Victoria. Tassel ferns are epiphytes, with long dangling stems. Some end in long tassel-like ‘clubs’, which are the spore-bearing cones, rather than those on staginella. However in H. squarrosa the fertile spore-bearing leaves are the same as the normal leaves, a characteristic considered very primitive and indicative of its ancient lineage. Related to the tassel ferns is a vigorous scrambling ground-creeping version (Lycopodium cernuum), which is common along sunny roadsides. It looks like a tiny pine tree with little cones on the erect branches. Stems pendent or arching, much branched, up to 60 cm long; leaves up to 1.2 cm long, very crowded, pale yellow-green, linear-acuminate with a long, pointed apex, spreading. Sporangia borne in the bases of the upper leaves, kidney-shaped, bright yellow; sporophylls smaller and less spreading than basal leaves, crowded. It is a very popular species, which is widely cultivated as a basket plant throughout eastern Australia, with some magnificent specimens to be seen in council conservatories etc. It grows on trees in low-land swamps and rainforests and appears to be quite rare in its native habitat. The spreading, acuminate, pale-green leaves. The partially differentiated sporophylls crowded at the tips. As for other tassel ferns. Requires heat in southern Australia. Jones.D.L, Clemesha. S.C., Australian Ferns and Fern Allies, 1980. 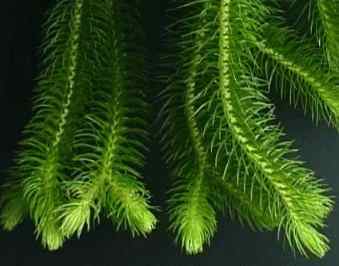 'Tassel ferns' Huperzia/Lycopodium spp. are small leaved plants that hang down from trees as epiphytes, thus resembling tassels decorating the rainforest canopy (left). They can easily be seen in the Daintree lowlands, such as along Mossman River.